I've wanted to visit Yellowstone National Park in the dead of winter for years, since seeing a bundled-up ranger on TV describe Yellowstone as the coldest place in the continental US. He was right, but notwithstanding the occasionally frigid weather (the lowest Yellowstone temperature recorded was -66F or -54C) it's surprisingly easy to explore at least a part of the park. Yellowstone in winter is an entirely different park from the one you see in summer: the crowds are gone, wildlife is easier to see, and the landscape takes on a magical air. This page provides a brief description of some of the winter activities and photographic opportunities I found in Yellowstone. In winter most roads and entrances to Yellowstone are closed to regular traffic, and one's options for visiting the interior of the park revolve around the various means of over-the-snow travel: skis, snowmobiles, or snow coaches. I drove from Gardiner, Montana, to Mammoth Hot Springs, and took a snow coach to Old Faithful for a few days of snow-shoeing, wildlife watching, and photography. The video gives an overview of the trip. 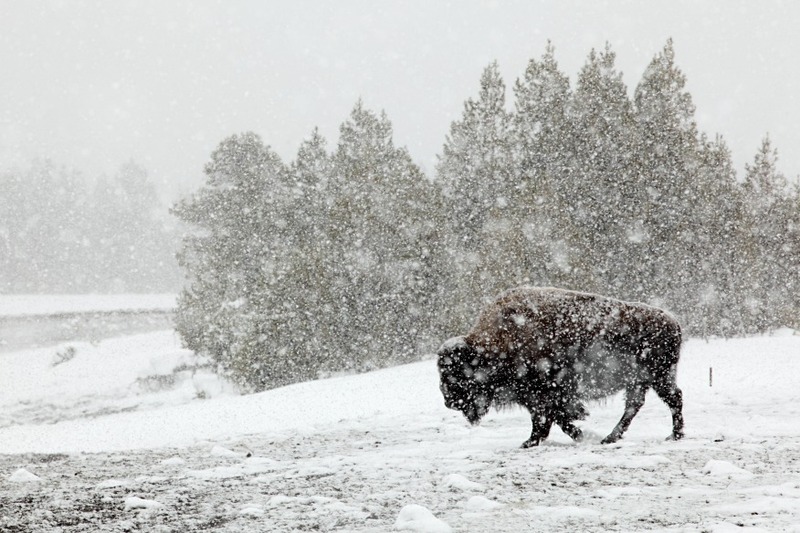 The winter season in Yellowstone is a moveable feast defined by when there's enough snow for over-the-snow travel on the park's roads. Normally it runs roughly mid-December to mid-March. During winter, the only entrance that's open to regular traffic is the northern gateway at Gardiner, Montana. 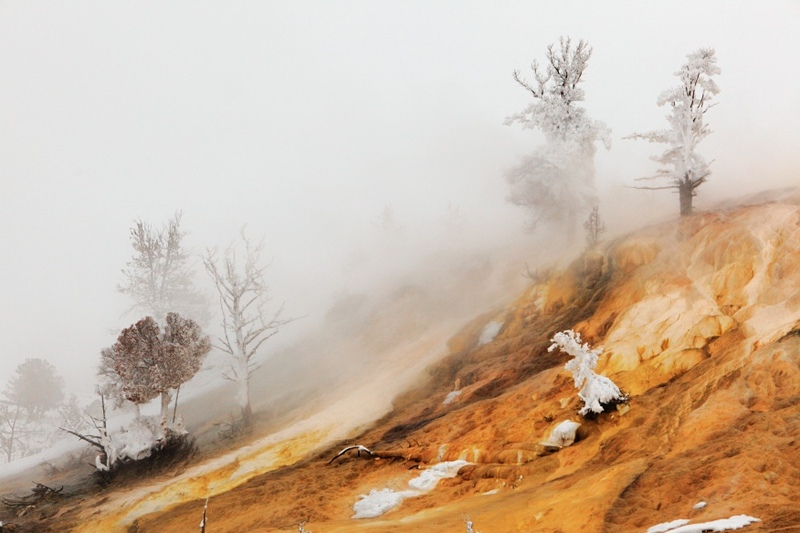 From there you can drive to Mammoth Hot Springs, where the Mammoth Hot Springs hotel remains open. 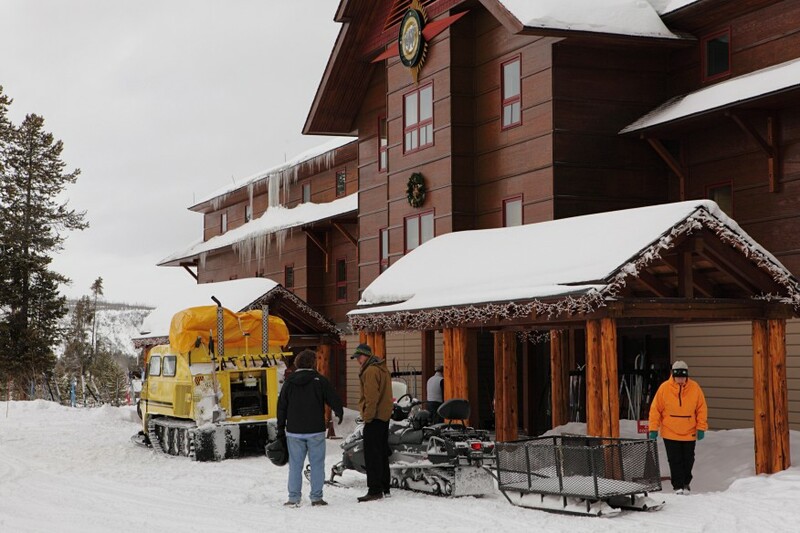 The hotel is something of a base for wildlife watching tours and snow-coach excursions deeper into the park, which is as well as there's not a tremendous amount to do at Mammoth in the winter. 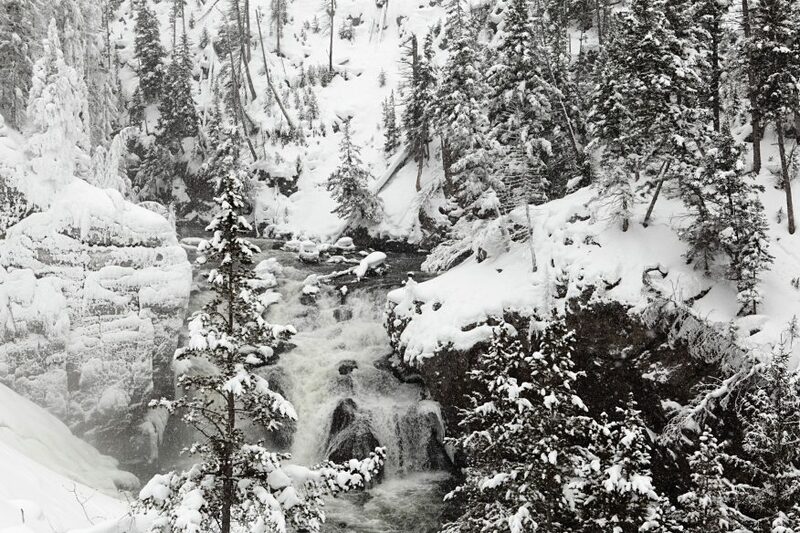 The terraces and hot springs make for striking photographic subjects in the snow, but the immediate environs of the hotel can easily be explored in a single day. From Mammoth, the road south toward Old Faithful and West Yellowstone is groomed for snow-coaches and snowmobiles only. The road east toward Cooke City, though, is plowed and open to regular vehicles. It's about 50 - very scenic - miles to Cooke City, crossing first the Blacktail Plateau and later entering the Lamar Valley. This is the easiest place in Yellowstone where you might have a shot at seeing or hearing wolves, and one of the classic Yellowstone winter tours is to drive this road with a wildlife guide at dawn in the hope of spotting them. 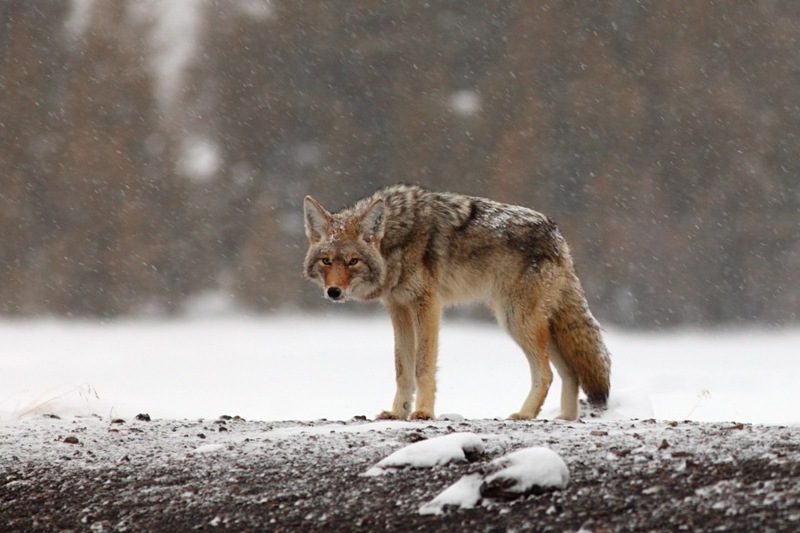 Your chances are dependent on the vagaries of wolf pack populations, and whether any of them choose to hang out near the road (there's a lot of Yellowstone that is not near a road! ), but they're probably pretty good. If you choose to drive the road yourself, be aware that although it's plowed it can still be snowpacked and potentially tricky to drive without 4WD. Even if you don't see any wolves - I didn't - you're almost guaranteed to see bison, elk and deer. Leaving Mammoth, I took a snow-coach to Old Faithful. Snow-coaches in Yellowstone come in two flavors. The classic variety are the purpose-built vehicles that featured in the old Bond movies, made by Bombadier as long ago as the 1950s, and still in service for Yellowstone tours. The more modern, but less romantic kind, are regular vans outfitted with tracks rather than tyres. They don't move very fast. 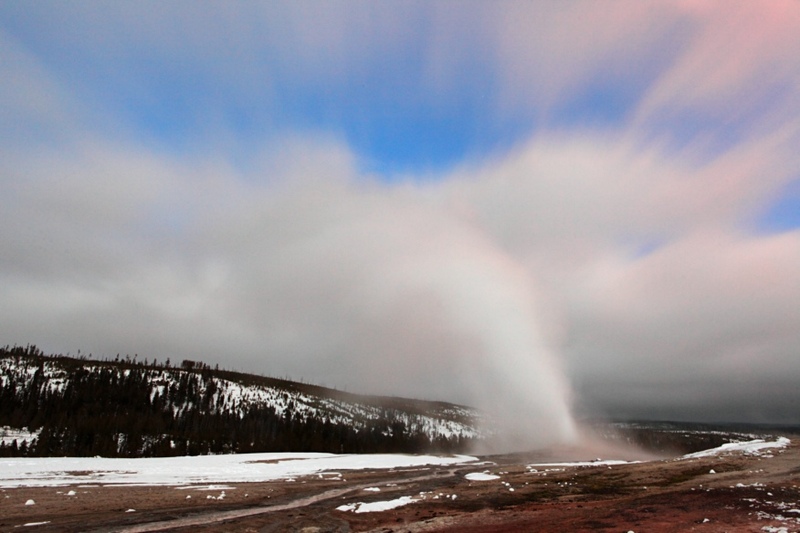 From Mammoth, it takes 4 or 5 bumpy hours to make it to Old Faithful. 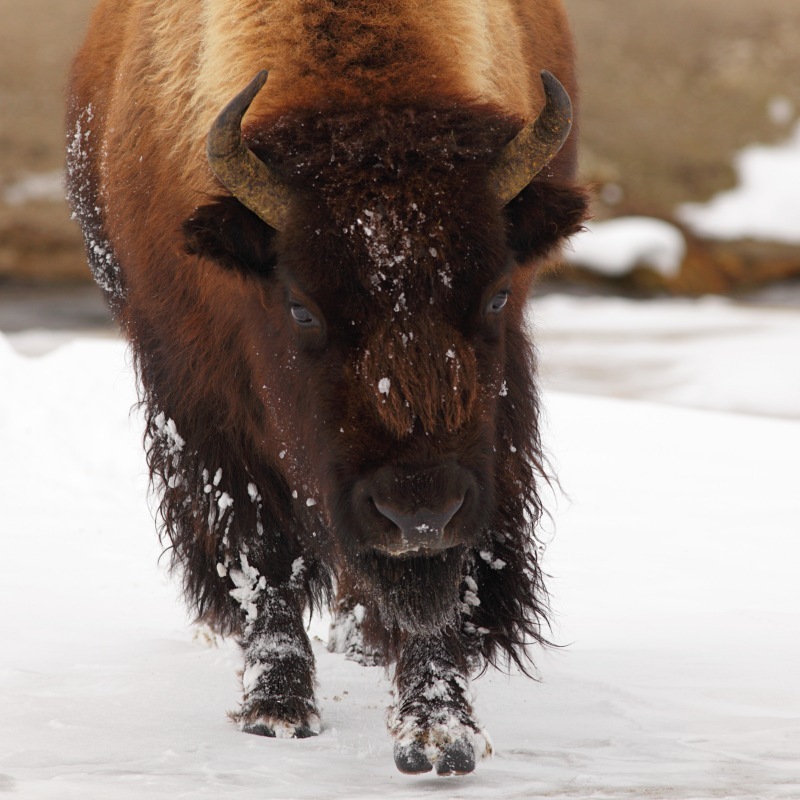 Along the way, the driver generally makes a couple of scheduled stops at thermal areas or landmarks near the road, and also stops whenever interesting wildlife is sighted - eagles and bison on my trip. If you're familiar with the bus system in Denali National Park, in Alaska, the Yellowstone system in winter is very similar. Just as in Denali, it's the luck of the draw as to how knowledgeable or entertaining the driver is, but I was lucky twice so I surmise that you're unlikely to be disappointed. It's a memorable trip. 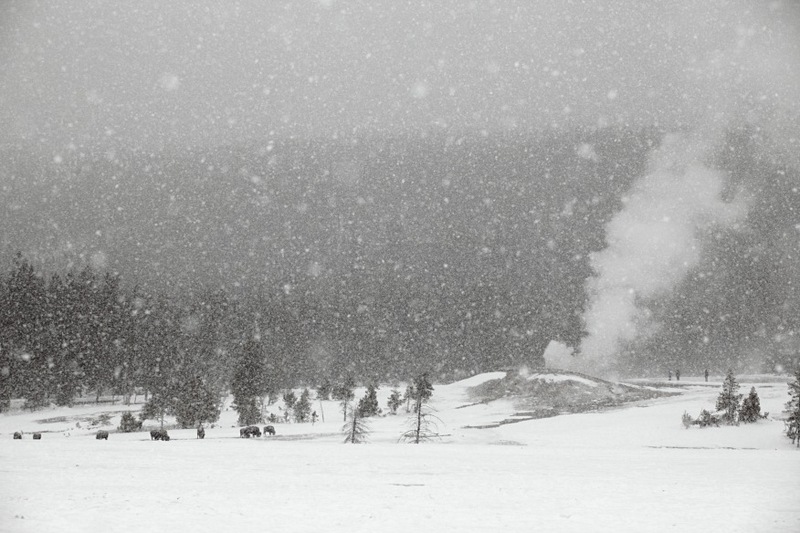 Old Faithful is the only place in the interior of the park where you can stay in winter. The famous and historic Old Faithful Lodge is closed - I imagine the heating bill would be astronomical - but you can stay either in the modern Old Faithful Snow Lodge or in some somewhat cheaper cabins that are attached to the Lodge. There's a reasonably nice restaurant, a fast food place, and a ski / snow-shoe rental shop within the Lodge, and it's just a very short walk to the Old Faithful visitor center (which remains open in winter) and to the namesake geyser itself. Booking well in advance is necessary, but it's not crazily over-booked like some National Park lodges. Biscuit Basin trail (5 miles out-and-back, flat). This is an easy trail which passes by a succession of geysers and other thermal features en route to Biscuit Basin. The only downside is that Biscuit Basin is on the main road, and frequented by parties of snowmobilers. But most of the time it's empty - quite a contrast to the summer crowds. Black Sand Basin trail (4 miles, almost flat). This is another easy snow-shoe, which starts along the same route as the trail to Biscuit Basin. Once I left the main trail, I saw no-one else until I got to the geyser basin. The panorama above was taken at the Black Sand Basin, which on the day I visted was over-run with bison grazing near the warm river waters. Lone Star Geyser trail (9 miles, 240 feet of elevation gain). A longer, but still fairly easy route up to a reliable geyser that's a bit off the beaten track (even in summer, never mind winter). In addition to these easy trip - which were all I tried - the Park issues a winter trails guide that lists maybe half a dozen other moderate to more difficult trails. All told, there's certainly enough to keep one busy for several days in the vicinity of Old Faithful. Of course, one's enthusiasm for skiing or snow-shoeing, or for waiting around for geysers to erupt, is likely to be dampened if it's 20 below zero and blowing a gale! Here one is really at the mercy of the elements - although it can indeed be bitterly cold you can also be lucky, as I was, and find the temperature "only" just below freezing. It did snow - a lot - but the wind was calm and it made for very pleasant conditions to be outside on the trails. I'm not a tremendous fan of geysers - once you've seen one you've pretty much seen enough to get the idea, in my opinion - so the highlight of my own Yellowstone vacation was watching and photographing the wildlife. You won't see any hibernating bears, but the rest of the large species are much easier to see in winter than in summer as they tend to congregate near the thermal features. I saw coyotes, eagles, and enough bison that by the end of my brief stay I was slmost bored with them! Caution is needed around bison, of course, especially when you're out on the trail when it's surprisingly easy to find your way blocked and bison all around you. But with that in mind, it's easy and a really amazing experience to watch these animals ekking out an existence in such incredibly harsh conditions. 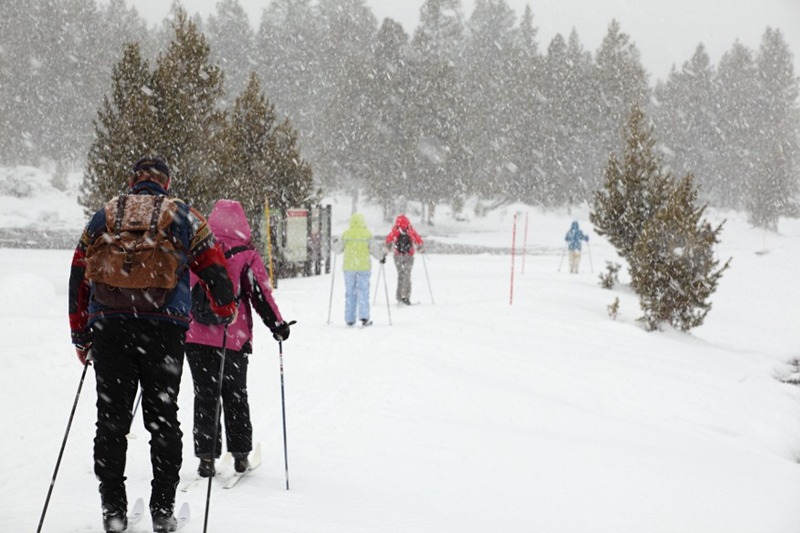 The National Park Service maintains a list of winter services in Yellowstone, along with a web page of businesses with permits to offer tours and other activities.